Splash pages, you gotta' love 'em. A blank canvas where the artist can hit the reader with a large dose of illustrated 'wow'. This week, it's one of those double-page spreads you revisit and you wonder how you ever forgot them. Rags Morales plus Hawkman vol3 #5 equals one smacked out Green Arrow. If you can imagine this at 100% of it's original size, you'll get that you almost end up black and blue just by looking at it. Note; the mace still tied firmly in place. Yip boys and girls, when it comes to Hawkman weapons are optional. What set the birdman off? Oliver's remark on the previous page "You don't know a thing about love. All you know is obsession." Saying stuff like that is never gonna go down well. ...I take it the Arrow's a bit of an a-hole? Uh...yeah. He is. And he and the Hawk do NOT get along well. Besides which, I don't think Arrow is one who should be talking much about obsession. Or critiquing anyone's love-life. Yeah RN - I find it hardcase anyone wearing a mask and fighting crime can lecture another on obsession. It's the nature of the beast! Still this blog needed more GA nad Hawk, so I'm glad this little number came up! great picture. I love that he's decking GA right off the roof. 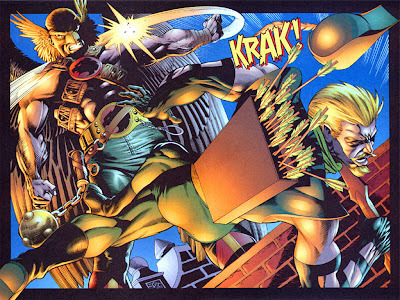 oh that's not right how dissed Green Arrow with that back hand. by the way folks, Gerard Butler would make a great Carter Hall!